The atomic bomb, and nuclear bombs, are powerful weapons that use nuclear reactions as their source of explosive energy. Scientists first developed nuclear weapons technology during World War II. 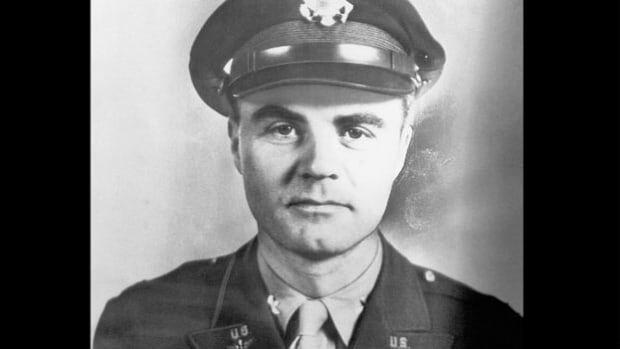 Atomic bombs have been used only twice in war—both times by the United States against Japan at the end of World War II. A period of nuclear proliferation followed that war, and during the Cold War, the United States and the Soviet Union vied for supremacy in a global nuclear arms race. A discovery by nuclear physicists in a laboratory in Berlin, Germany, in 1938 made the first atomic bomb possible, after Otto Hahn, Lise Meitner and Fritz Strassman discovered nuclear fission. When an atom of radioactive material splits into lighter atoms, there’s a sudden, powerful release of energy. The discovery of nuclear fission opened up the possibility of nuclear technologies, including weapons. Atomic bombs are weapons that get their explosive energy from fission reactions. Thermonuclear weapons, or hydrogen bombs, rely on a combination of nuclear fission and nuclear fusion. Nuclear fusion is another type of reaction in which two lighter atoms combine to release energy. 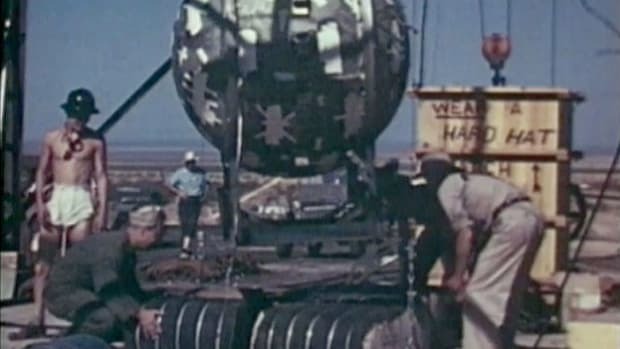 The Manhattan Project was the code name for the American-led effort to develop a functional atomic bomb during World War II. 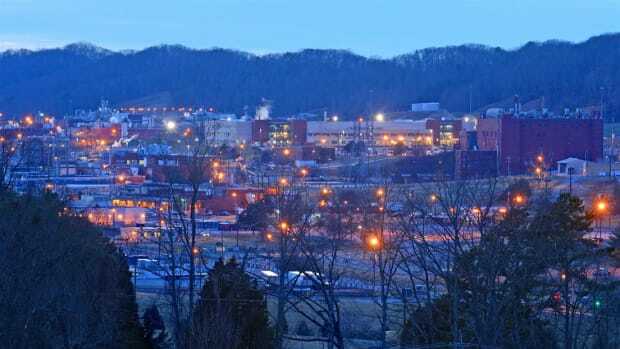 The Manhattan Project was started in response to fears that German scientists had been working on a weapon using nuclear technology since the 1930s. On December 28, 1942, President Franklin D. Roosevelt authorized the formation of the Manhattan Project to bring together various scientists and military officials working on nuclear research. Much of the work was performed in Los Alamos, New Mexico, under the direction of theoretical physicist J. Robert Oppenheimer. On July 16, 1945, in a remote desert location near Alamogordo, New Mexico, the first atomic bomb was successfully detonated—the Trinity Test. It created an enormous mushroom cloud some 40,000 feet high and ushered in the Atomic Age. 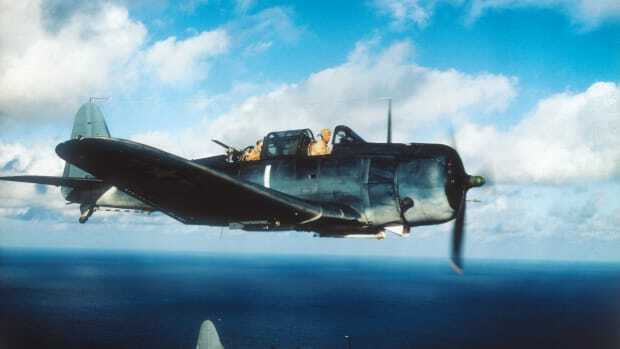 While the war in Europe had ended in April, fighting in the Pacific continued between Japanese forces and U.S. troops. In late July, President Harry Truman called for Japan’s surrender with the Potsdam Declaration. The declaration promised “prompt and utter destruction” if Japan did not surrender. On August 6, 1945, the United States dropped its first atomic bomb from a B-29 bomber plane called the Enola Gay on Japanese city of Hiroshima. 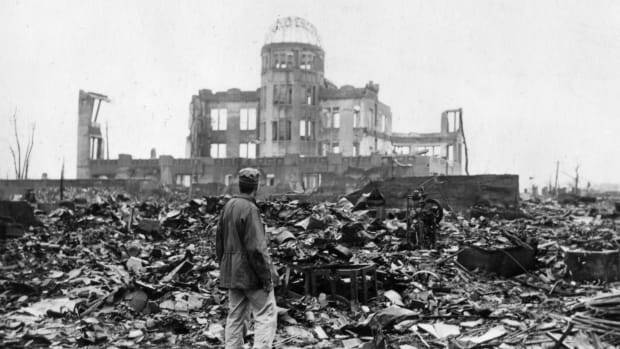 The “Little Boy” exploded with about 13 kilotons of force, leveling five square miles of the city and killing 80,000 people instantly. Tens of thousands more would later die from radiation exposure. When the Japanese did not immediately surrender, the United States dropped a second atomic bomb three days later on the city of Nagasaki. 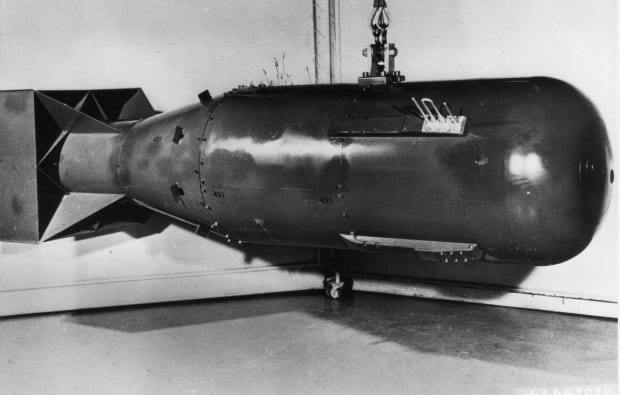 The “Fat Man” killed an estimated 40,000 people on impact. Nagasaki had not been the primary target for the second bomb. American bombers initially had targeted the city of Kokura, where Japan had one of its largest munitions plants, but smoke from firebombing raids obscured the sky over Kokura. American planes then turned toward their secondary target, Nagasaki. 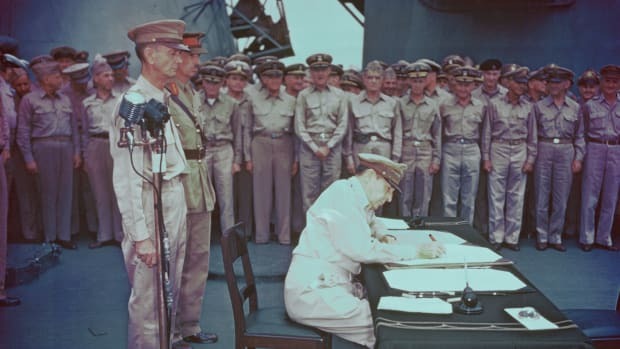 Citing the devastating power of “a new and most cruel bomb,” Japanese Emperor Hirohito announced his country’s surrender on August 15, ending World War II. The United States was the only country with nuclear weaponry in the years immediately following World War II. The Soviets initially lacked the knowledge and raw materials to build nuclear warheads. Within just a few years, however, the U.S.S.R. had obtained—through a network of spies engaging in international espionage—blueprints of a fission-style bomb and discovered regional sources of uranium in Eastern Europe. On August 29, 1949, the Soviets tested their first nuclear bomb. The United States responded by launching a program in 1950 to develop more advanced thermonuclear weapons. The Cold War arms race had begun, and nuclear testing and research became high-profile goals for several countries, especially the United States and the Soviet Union. Over the next few decades, each world superpower would stockpile tens of thousands of nuclear warheads. Other countries, including Great Britain, France, and China developed nuclear weapons during this time, too. To many observers, the world appeared on the brink of nuclear war in October of 1962. The Soviet Union had installed nuclear-armed missiles on Cuba, just 90 miles from U.S. shores. This resulted in a 13-day military and political standoff known as the Cuban Missile Crisis. President John F. Kennedy enacted a naval blockade around Cuba and made it clear the United States was prepared to use military force if necessary to neutralize the perceived threat. Disaster was avoided when the United States agreed to an offer made by Soviet leader Nikita Khrushchev to remove the Cuban missiles in exchange for the United States promising not to invade Cuba. 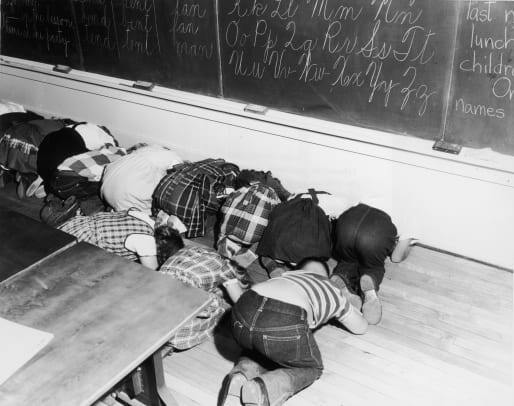 Many Americans became concerned about the health and environmental effects of nuclear fallout—the radiation left in the environment after a nuclear blast—in the wake of World War II and after extensive nuclear weapons testing in the Pacific during the 1940s and 1950s. The antinuclear movement emerged as a social movement in 1961 at the height of the Cold War. During Women Strike for Peace demonstrations on November 1, 1961, roughly 50,000 women marched in 60 cities in the United States to demonstrate against nuclear weapons. The antinuclear movement captured national attention again in the 1970s and 1980s with high profile protests against nuclear reactors after the Three Mile Island accident—a nuclear meltdown at a Pennsylvania power plant in 1979. In 1982, a million people marched in New York City protesting nuclear weapons and urging an end to the Cold War nuclear arms race. It was one of the largest political protests in United States history. The United States and Soviet Union took the lead in negotiating an international agreement to halt the further spread of nuclear weapons in 1968. The Treaty on the Non-Proliferation of Nuclear Weapons (also called the Non-Proliferation Treaty or NPT) went into effect in 1970. It separated the world’s countries into two groups—nuclear weapons states and non-nuclear weapons states. Nuclear weapons states included the five countries that were known to possess nuclear weapons at the time—the United States, the U.S.S.R., Great Britain, France and China. According to the treaty, nuclear weapons states agreed not to use nuclear weapons or help non-nuclear states acquire nuclear weapons. They also agreed to gradually reduce their stockpiles of nuclear weapons with the eventual goal of total disarmament. Non-nuclear weapons states agreed not to acquire or develop nuclear weapons. When the Soviet Union collapsed in the early 1990s, there were still thousands of nuclear weapons scattered across Eastern Europe and Central Asia. Many of the weapons were located in Belarus, Kazakhstan and Ukraine. These weapons were deactivated and returned to Russia. Some countries wanted the option of developing their own nuclear weapons arsenal and never signed the NPT. India was the first country outside of the NPT to test a nuclear weapon in 1974. Other non-signatories to the NTP include: Pakistan, Israel and South Sudan. Pakistan has a known nuclear weapons program. Israel is widely believed to possess nuclear weapons, though has never officially confirmed or denied the existence of a nuclear weapons program. South Sudan is not known or believed to possess nuclear weapons. North Korea initially signed the NPT treaty, but announced its withdrawal from the agreement in 2003. Since 2006, North Korea has openly tested nuclear weapons, drawing sanctions from various nations and international bodies. North Korea tested two long-range intercontinental ballistic missiles in 2017—one reportedly capable of reaching the United States mainland. In September 2017, North Korea claimed it had tested a hydrogen bomb that could fit on top an intercontinental ballistic missile. Iran, while a signatory of the NPT, has said it has the capability to initiate production of nuclear weapons at short notice. Pioneering Nuclear Science: The Discovery of Nuclear Fission. International Atomic Energy Agency. The Development and Proliferation of Nuclear Weapons. nobelprize.org. Here are the facts about North Korea’s nuclear test. NPR.